So, maybe you've been wondering about my life for the last few weeks...it's been busy, that's for sure. I only have a few minutes today, but I thought I'd update my readers (hello, out there!). Last week I went to Vancouver with a team from my church to help out a new church plant on the campus of the University of British Columbia. It's called Origin Church and we helped them by prayerwalking on the campus and talking to as many students/people as we could about the church. To be honest, it was difficult. The people in Vancouver don't make eye contact and think you are kinda strange if you talk to them! At least, this was our experience. Nonetheless, God is doing great things there and the ministries that we worked with last week are glorifying Him. That's what matters. We were able to encourage ministers in several areas, not only Origin Church, but also a campus chaplain, the pastor at the church where we stayed, and the pastor of another church plant in a nearby suburb. All of these people are working hard to plow the ground in Vancouver. The seeds sometimes seem to fall on concrete, but God is breaking up the fallow ground there (thanks for that analogy, Ashley). It was a good week. I really got to know some great people - the mission team I was working with, the ministers in Vancouver, and some of the few Christians that we met on campus. 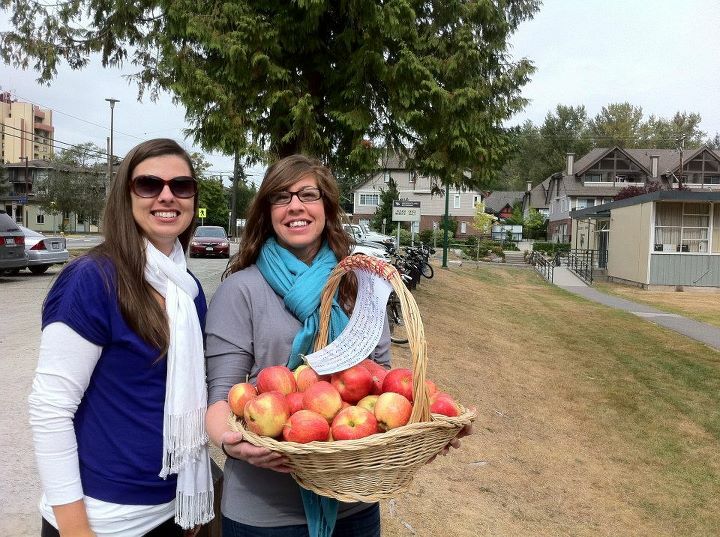 Here we are taking apples to a local school, with the love of Christ! This coming Tuesday I leave again...this time for Germany. That's where Hampton is and I can't wait to see him! We are going to take a little European tour and spend some much needed quality time together. Due to these two trips, I have been very busy - not only with the actual going, but also with trying to keep up with (and stay ahead of) my school work. Thankfully, I decided to only take one class right now and it's going well. So, with all of this going on, you may be wondering how my running is going. WELL, it's going okay. I actually had a couple of really great 6-mile runs a couple of weeks ago before I went to Vancouver. Then, in Vancouver, one run was just sad - walked most of it and had NO idea how far we went - and the other run was just around the church parking lot a few times and up and down the stairs! HAHA. Yesterday, we intended to run 6 again, but ended up walking most of the last half. This Saturday is a big run - 10 miles, since I haven't done that yet. Then, the countdown begins. The Half-Marathon is only 2 weeks from this Sunday!!! I'll admit, I'm WAY nervous. I just don't feel ready. But I'm determined and I know I'll at least finish.